Lying southeast of Miami and northeast of Caracas, Venezuela, the eastern Caribbean island of Barbados is an independent British Commonwealth nation. It shares a turbulent past with much of the region. Inhabited by the Amerindians during the 4th to 7th centuries AD, then Kalinago people in the 13th century, Barbados was later claimed for Spain during the late 1400s. The island's first permanent settlers arrived in 1627 from England, and the rest is history. Recently, the capital, Bridgetown, and its Garrison, a striking example of British colonial architecture, were registered on the UNESCO World Heritage List. 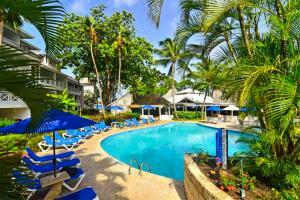 The island straddles both the mighty North Atlantic Ocean and sparkling Caribbean Sea. It also bridges two distinct cultures, West African and European. Many locals speak with a lilting British accent, spiced with West African-English pidgin, known as Bajan. The island combines the best of both worlds with afternoon teas and spirited rum and polo matches. Even though Barbados gained full political independence from Britain in 1966, its residents retained their traditional parliamentary democracy. From sugar cane fields, Indian rotis and curries to regattas, English gardens and cricket matches, all paths on this magical isle lead towards the deliciously unconventional. Barbados Our 4-Star classification designates those properties with well-appointed, deluxe accommodations, extensive amenities and comprehensive guest services. Expect attention to detail and a warm and hospitable staff ready to cater to your needs. These superb properties offer a truly refined getaway.